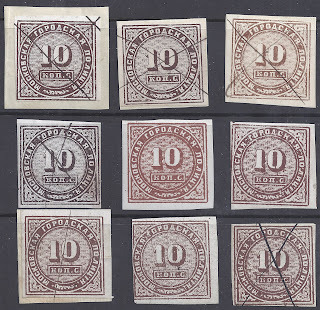 Trevor Pateman's Philately Blog: Moscow Fiscals of the 1860s - a rival to Zemstvos? Moscow Fiscals of the 1860s - a rival to Zemstvos? 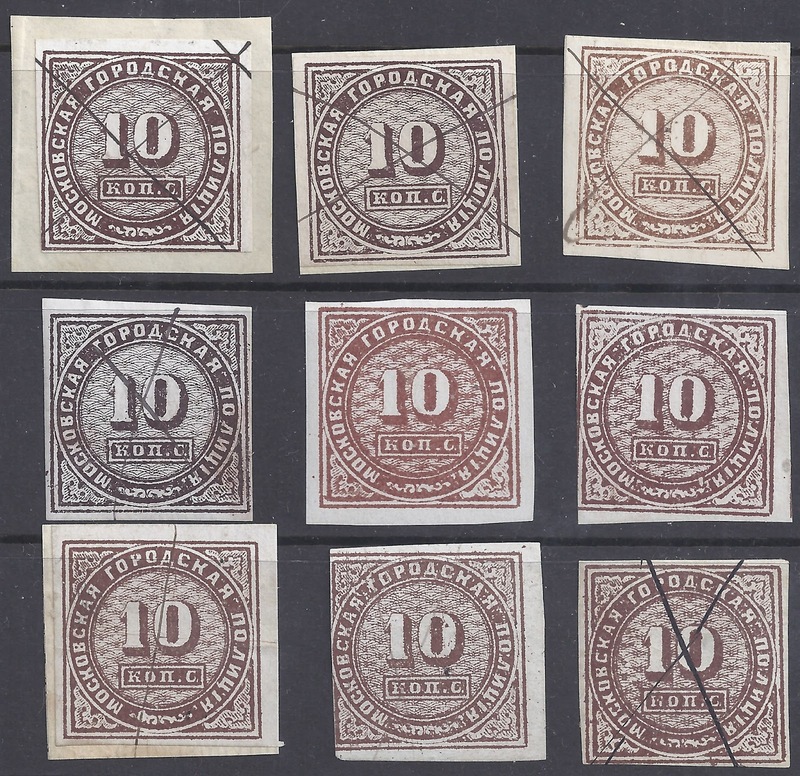 You could probably find 9 copies of Russia #1 faster than you could find 9 examples of the Moscow Town Police revenue stamps shown above. These revenue stamps date from the 1860s. Their design and printing is much inferior to that of Russia #1 - so if you like "primitive" Zemstvo stamps you might like these too. It is obvious that there is great variation in colour - in Row 2, for example, the first stamp is almost black but the second stamp is chestnut brown (this second stamp was acquired by Agathon Fabergé in 1906 - pencil note on reverse). The printing plate -which I guess is lithographic - also deteriorated. The stamps in the right hand column are from worn plates. Look at the ornaments in the four corners to get an idea of what happens as the plate is used: the detail and shading disappear. Because these stamps were used and used up before philately got really established - or began to take an interest in revenue stamps - it is very unusual to find multiples or mint stamps. Agathon Fabergé occasionally had mint stamps with full gum in his collection but for these 1860s issues they are rare. Sometimes these stamps were not cancelled so it looks as if they are mint - like the chestnut brown stamp above - but in fact they have no gum and simply lack a pen cross cancel. These Moscow fiscals should appear in that auction later in 2013.